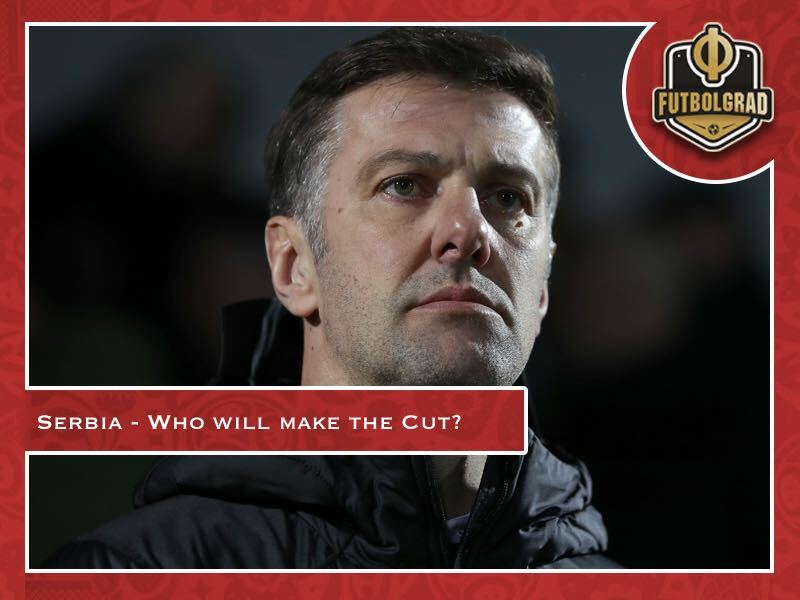 Krstajić – Who will make Serbia’s World Cup squad? Despite much anticipation, Serbia manager Mladen Krstajić did not announce his preliminary World Cup squad on Monday. The announcement was delayed until Thursday, leaving those eagerly awaiting the Orlovi squad selection another few days of speculation. I have compiled the following analysis of who 50 players in contention for a spot on the plane to Russia, for what is Serbia’s first competitive tournament in eight years. The often-controversial Vladimir Stojković has spent the better part of the last 12 years as the national team’s number one and will most likely be between the sticks against Costa Rica on June 17. However, the emergence of Eibar shot-stopper Marko Dmitrović has not gone unnoticed, and Krstajić handed the 26-year-old his first cap against South Korea last November. On current form, he is Serbia’s best goalkeeper, but the disruption of team harmony could follow any attempts to strip Stojković of his first-choice status. Dmitrović rise, however, has shifted highly-rated 22-year-old custodian Predrag Rajković of Maccabi Tel Aviv to the third choice, with the younger duo expected to battle it out for the number one jersey in the post-Stojković era. 25-year-old Danish-based goalkeeper Aleksandar Jovanović (AGF) and the imposing Vanja Milinković-Savić (Torino) are stand-by options should any of the trio above drop out. With Krstajić opting to return to a traditional four-man defence, Villarreal’s Antonio Rukavina is considered to be the front-runner for the right-sided full-back role given he started in all but one of Serbia’s ten qualifiers. However, the 34-year-old is perceived to be a liability and does not provide as much penetration in attack as what many would expect from a modern-day full-back. The surprise call-up of Lazio defender Dušan Basta for the March friendlies is seen as a threat to Rukavina’s hold on the position, with the 33-year-old being one of two survivors – alongside Stojković – of Serbia and Montenegro’s ill-fated 2006 World Cup campaign in Germany. Despite being one of the best full-backs in the Serie A over a period of six seasons (2011-17), Basta showed signs of slowing down this term and has only made 18 national team appearances since his debut in 2005. Former captain Ivanović remains another option in that position however his declining pace might leave him exposed while Chievo’s on-loan Fiorentina right-back Nenad Tomović has not featured for the Eagles since 2015.
Who starts at the heart of the defence against Costa Rica is subject to much contention within Serbian football. 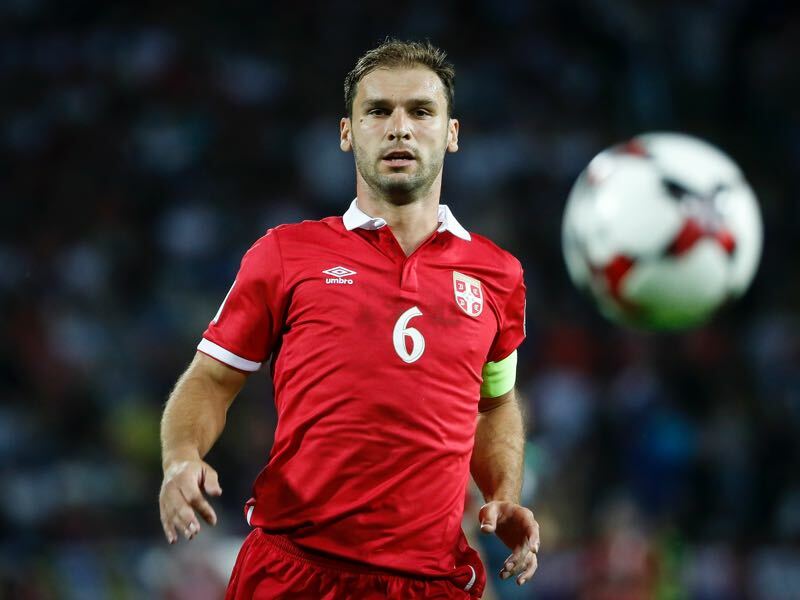 Popular 34-year-old Branislav Ivanović seemed a sure starter until he was dropped as captain in March by Krstajić, a move which raises doubts as to his involvement within the squad, with Ivanović almost certain to break Dejan Stanković national appearance record should he be called upon. Former Manchester City centre-back Matija Nastasić is facing a race against time to be fit for the tournament after suffering ligament damage in early April, with the 25-year-old maturing under Domenico Tedesco at Schalke this term. While Nastasić’s struggles against physical opponents have been well documented, he featured more times in qualifier than any other centre-back bar Ivanović and is calm in possession. 26-year-old Nikola Maksimović was often used throughout qualifying and got some much-needed game time while on loan at Spartak Moscow towards the back end of the season after struggling to break into the Napoli starting XI during his 18-month spell in Naples. However, his performance alongside 33-year-old Duško Tosić in the 2-1 defeat to Morocco was far from convincing. Former Besiktas captain Tosić started the final qualifier v Georgia and last week secured a move to Chinese Super League side Guangzhou R & F – who are managed by Serbian great Dragan Stojković – after three successful seasons at Vodaphone Park. While popular among the dressing room, he is not as comfortable in possession as other candidates and has a tendency to be exposed against the higher-calibre opposition. 29-year-old Jagoš Vuković featured in half of Serbia’s qualifiers and has found regular game time at Hellas Verona in the second half of this campaign after struggling to find his feet at parent club Olympiacos. 27-year-old Stefan Mitrović (Gent) has fallen off the radar under Krstajić despite being a regular squad member under his predecessors. Swiss-born U-20 World Cup winner Miloš Veljković made his international debut last November and has enjoyed a standout season with Krstajić’s former employers Werder Bremen this campaign. Uncapped at senior level, 20-year-old Nikola Milenković is winning plenty of admirers with his performances for Fiorentina and could replace former Viola defender Nastasić in the squad should he fail to recover from injury. 27-year-old Crvena Zvezda defender Vujadin Savić – son of Red Star legend Dušan Savić – was forced to withdraw from the March friendlies after sustaining an injury and is unlikely to be called up to the national team for the World Cup despite achieving domestic success. Former Borussia Dortmund defender Neven Subotić has enjoyed an excellent loan spell at St. Etienne after years of injury tribulations but supposedly called time on his national team career in 2016, at the tender age of 27. Nemanja Pejčinović won the Russian League with Lokomotiv Moscow but has barely featured for the national team in recent years, as has BATE Borisov’s Nemanja Milunović. No position in the national team is as certain as that of newly-appointed captain Aleksandar Kolarov at left-back, with the 32-year-old’s thunderous winner against the Republic of Ireland in Dublin being pivotal to Serbia’s qualification. 29-year-old Anderlecht left-back Ivan Obradović was Kolarov’s deputy in South Africa eight years ago and is likely to occupy that role this summer. 26-year-old Filip Mladenović (Lechia Gdańsk) commenced the Slavoljub Muslin-era as the back-up in that position but has regressed following failed stints at Cologne and Standard Liege respectively. Vice-captain Nemanja Matić (Manchester United) and box-to-box midfielder Luka Milivojević (Crystal Palace) have enjoyed standout seasons in the Premier League and are almost certain to start in Samara. Their defensive attributes should provide enough cover for the prodigious Sergej Milinković-Savić to be deployed in his preferred advanced midfield role. The 23-year-old was exceptional for Lazio throughout the Serie A season and is tipped to join one of Europe’s heavyweights at the conclusion of the World Cup. But which other midfield options join the trio in Russia is uncertain. Combative 26-year-old Nemanja Gudelj featured nine times in qualifying but was not called up to the most recent squad and is plying his club football in China with Fabio Cannavaro’s Guangzhou Evergrande. Energetic 22-year-old Liverpool midfielder Marko Grujić earned some much-needed game time while on-loan with Cardiff City in the Championship as he played his part in the Bluebirds promotion success. U-20 World Cup Final hero Nemanja Maksimović has featured more prominently for Valencia of late while fellow La Liga trio Darko Brašanac (Leganes), Saša Lukić (Levante) and Nemanja Radoja (Celta Vigo) are unlikely to earn selection despite impressing over the course of the season. 29-year-old defensive midfielder Ljubomir Fejsa looks set to miss out despite another solid campaign for Benfica, with the injury-prone enforcer’s commitment to the national team being called into question. 27-year-old Zvezda midfielder Nenad Krstićić earned a national recall for the tour to East Asia in November but is placed firmly down the pecking order as is 27-year-old Uroš Matić (Copenhagen), who is a considered to be a long shot in joining his older brother Nemanja in Russia. The team’s creative pivot is 29-year-old attacker Dušan Tadić who will look to put a disappointing club season with Southampton behind him, having starred for Serbia during the qualifiers. 25-year-old winger Filip Kostić experienced relegation with Hamburg this term but was a star performer for the Eagles in the early phases of qualifying. Mercurial talent Adem Ljajić returned to form with Torino towards the tail end of the Serie A season and is perceived as a favourite of the manager, having featured alongside him at Partizan earlier in his career. 23-year-old utility Mijat Gačinović capped off Eintracht Frankfurt’s cup win over Bayern München with a goal off the bench and made similar impacts off the bench during qualifying. Highly-rated 21-year-old Andrija ŽIvković did not feature under Muslin in qualifying but has progressed at Benfica this term after becoming the youngest national team player in 2013. 27-year-old Aleksandar Katai set up Aleksandar Mitrović’s crucial equaliser away to Wales in October 2016 but has fallen off the radar since a position not helped by his move to Chicago Fire earlier this year. 76-cap veteran Zoran Tosić spent his best years in Russia with CSKA Moscow, but the 30-year-old is considered an outside chance to make the squad having featured for Partizan this season. Staying in Serbia, 22-year-old Nemanja Radonjić enjoyed a breakout season with Crvena Zvezda and was rewarded with his national team debut last November. Miralem Sulejmani, although instrumental in Young Boys’ success in the Swiss league this term is unlikely to challenge some of his younger hopefuls for a ticket to Russia. Meanwhile, the one-time golden hope of Serbian football Lazar Marković (Anderlecht) was not called up during qualifying and at 24, appears to be at the crossroads of his young career after failing to settle at club level following his fourth loan away from Liverpool. Aleksandar Mitrović is the undisputed choice up forward and has rediscovered his form with Fulham in the second half of this season after an underwhelming spell at Newcastle United. The 23-year-old’s six goals in qualifying were instrumental in guiding the Orlovi to Russia, and he will be hoping to continue his good form next month. Former Switzerland U21 international Aleksandar Prijović made his Serbia debut last June and scored the goal that sealed passage to the World Cup against Georgia. His 19 goals for PAOK this term has seen him win the Golden Boot in Greece and the 28-year-old will most likely be utilised as an impact player off the bench. 20-year-old striker Luka Jović scored the goal that took Eintracht Frankfurt to the German Cup Final and scored eight times in the Bundesliga after being loaned out by Benfica earlier this season. Uncapped at senior level, he has mounted a formidable case for his inclusion and offered flexibility up front. 26-year-old forward Aleksandar Pešić is the bolter after scoring 25 times in 35 league games for Zvezda over the course of the Serbian Superliga campaign. Finally, 24-year-old Rapid Wien-bound striker Andrija Pavlović featured sporadically during qualifying and was at its commencement seen as Mitrović’s deputy but has had an indifferent league campaign with Copenhagen.